Charleston based DP Tom Wells and crew helped Adams Outdoor Advertising aquire footage for the company’s marketing efforts. The project included shooting multiple signs, digital billboards, traffic patterns and more around Charleston. 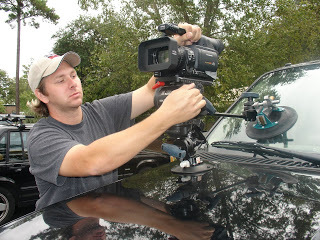 One setup included a time-lapse driving through the city’s interstate system using an on-car mount while shooting to P2 using the Panasonic HVX-200. The lightweight and compact size of the camera along with it’s flexible time-lapse intervalometer made it a great choice for the high speed application.